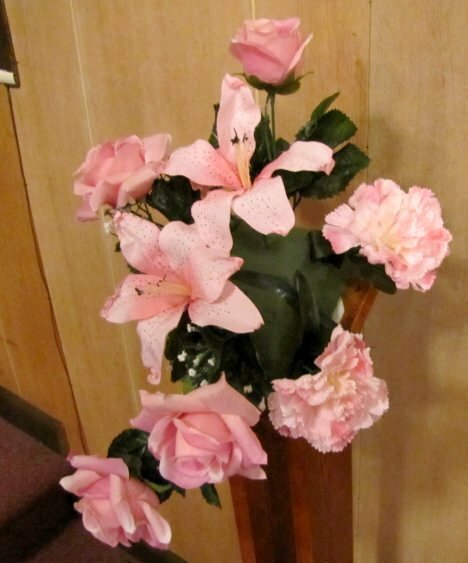 This church pew decoration flowers up pretty quickly, so you can either make enough to cover all your pews or just special ones to decorate your reserved family pews. 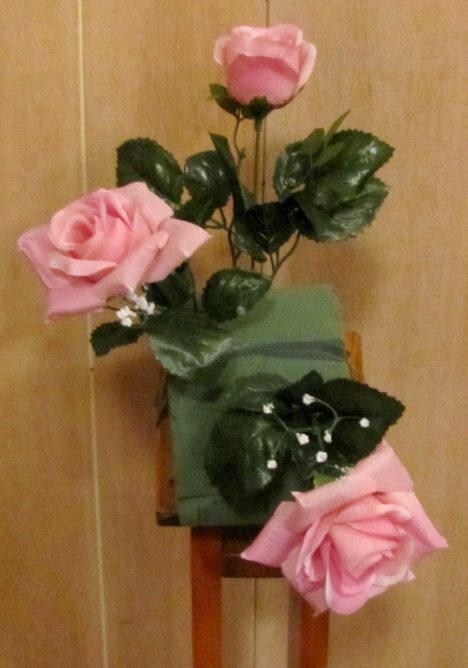 Continue by inserting another longer rose at the bottom of the cage, slightly turned to face the right side. I place another, just one head longer than the previous, to come out from the bottom facing to the left of the design. 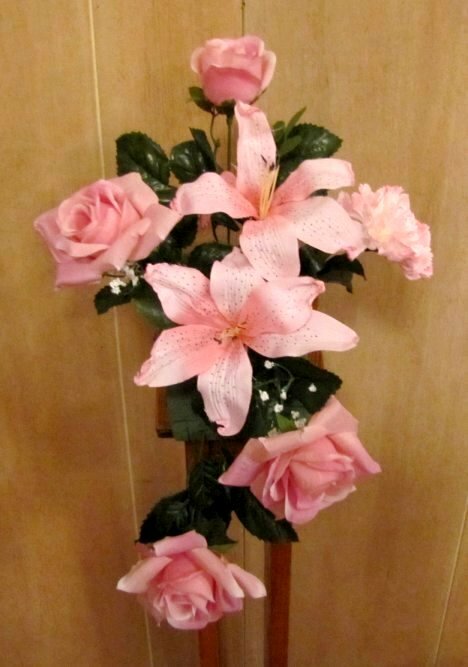 I now place two lilies, one dead center in the design and the second facing upwards and to the right. 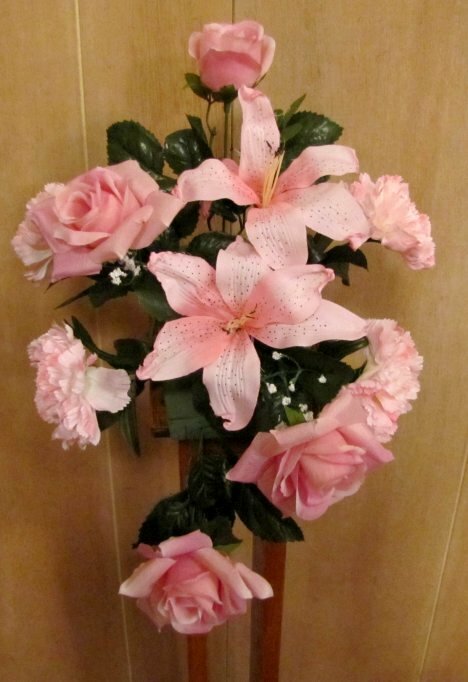 Now begin to fill in the sides of your pew decoration. 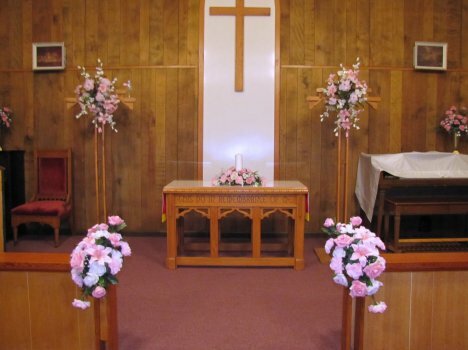 Remember that your church flowers should be able to be viewed from three sides, the front, the right and the left. Therefore take care that the cage and foam is concealed from all three views. 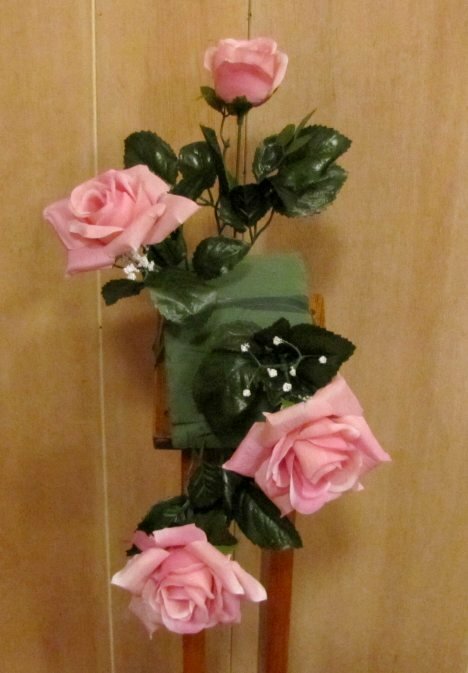 Here is a side view, showing the carnation placements on the side. 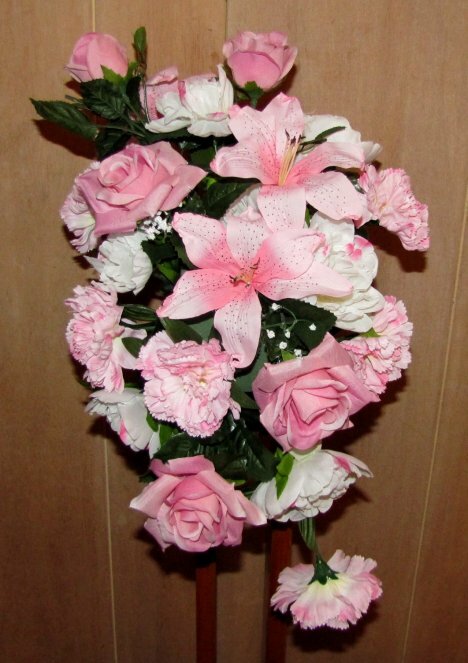 Duplicate those carnation placements on the left side as well. You can easily see the open spots in the design that need to be filled. 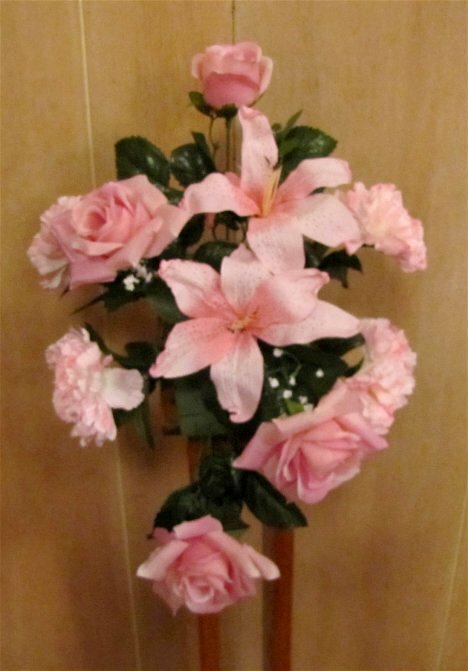 You can use peonies for this, pushing them closer in the foam so they create some depth perception in the final design. 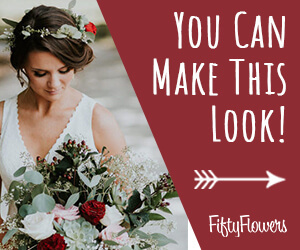 You may want to consider adding some miniature carnations or spray roses to your order to have on hand for any empty spots that need to be filled in. 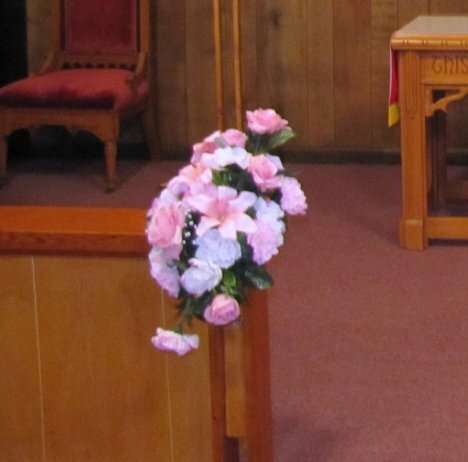 I created two mirror images of these floral sprays and set them on each side of the steps to the church altar section. Even though this was a small country church, you can see the need to "fill" the empty spaces at the front of the church. 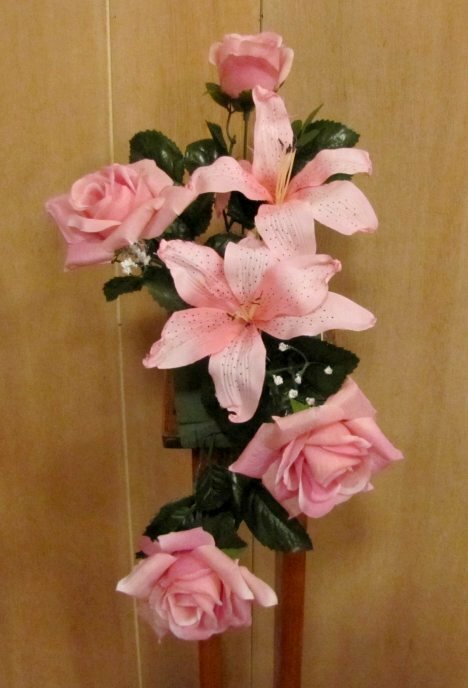 I have separate tutorials for the larger sprays on my site and for the tulle pew bows that were at the reserved sections for the family and the satin bows for the rest of the pews.